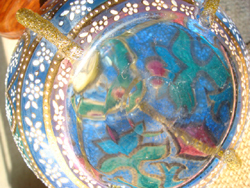 We stock all the leading exponents of 19th and 20th century glass manufacture. 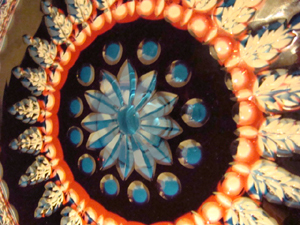 Below you will find a small selection of antique colored glass items from Stenschonau, Galle, Lalique, Despret and others showing techniques such as cameo. intaglio, and furnace work. 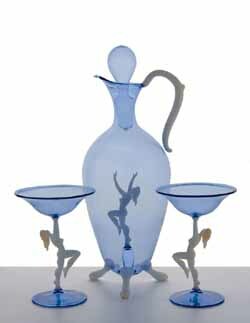 To request further details on any of our items please visit our contact page. 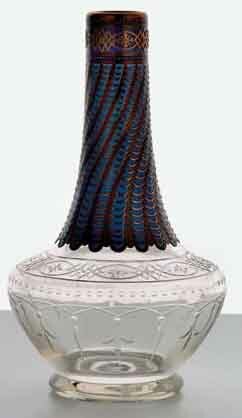 the heavy vase well engraved with 'Brickwork', etched mark, Baccarat, France, c1925-1935, 12in (30cm) approx. 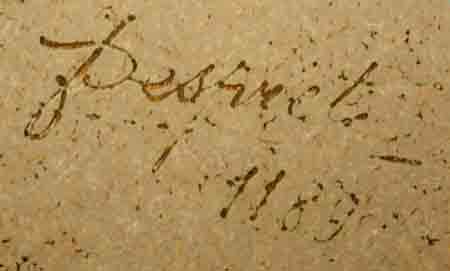 Sweden, signed Orrefors, G.A. 351, c.1929, 5 1/2in (14cm) high 7in (18cm) diam. 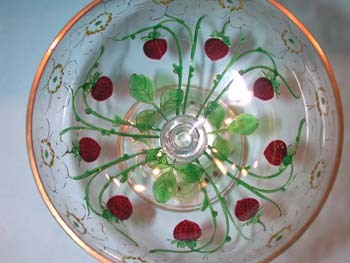 See 'The Brilliance of Swedish Glass', p.255, Yale University Press for a similar bowl. probably unique, 8 1/2in (21cm) approx. 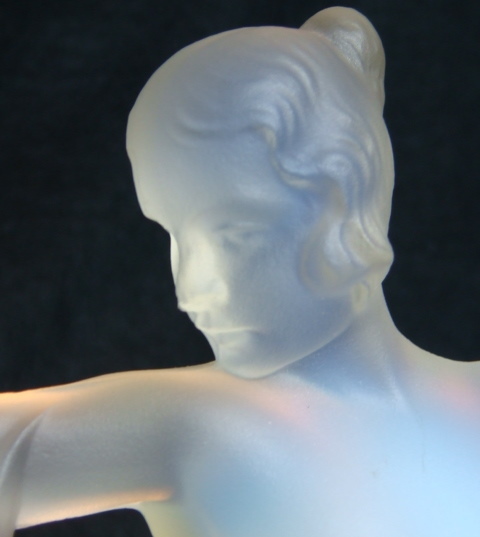 A detail of the Art Deco Saxaphone Player. 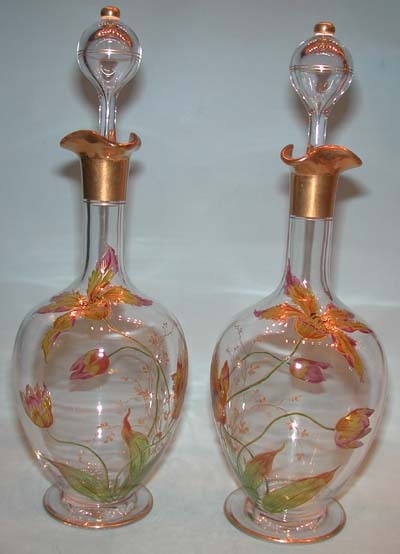 More Scent Bottles can be found on the 'Scent Bottles' page. 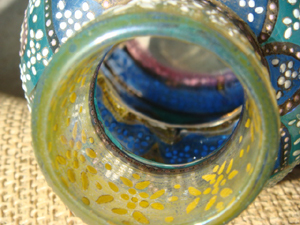 More opaline glass can be found on the 'Opaline' page. 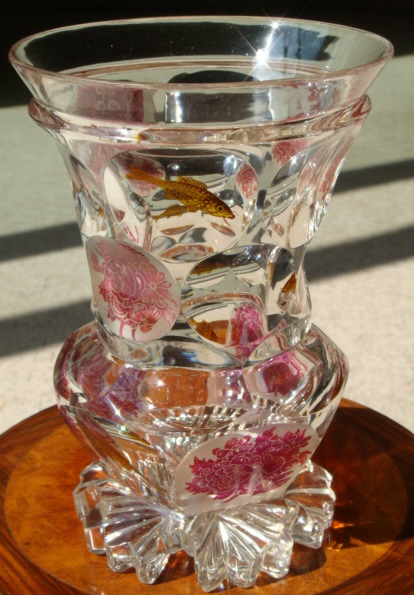 Imperial Glass Manufactory, enamelled with crowned arms, a latin inscription and a crest of two fishes, within gilt borders, c.1860-1890, decanter 7 1/4in (18.5cm). 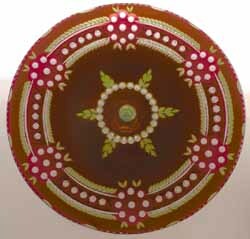 finely enamelled in polychrome colours signed Paris, c.1870, 7in (18cm) approx. 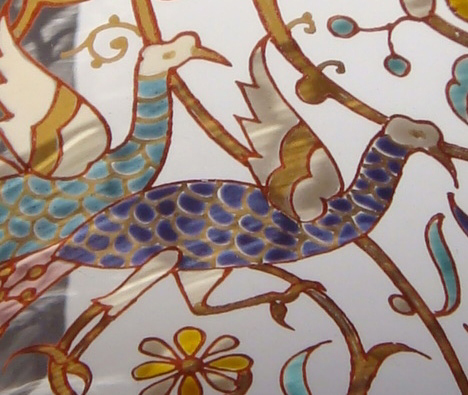 Detail of the decoration on the A. Bucan goblet. of trumpet form, enamelled and gilded with floral motifs, c 1870, 14in (36cm) approx. 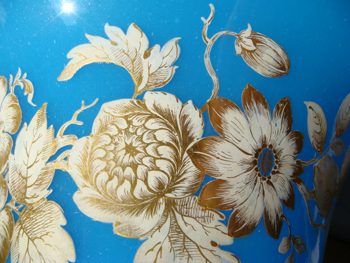 detail of the decoration on the Baccarat vase. 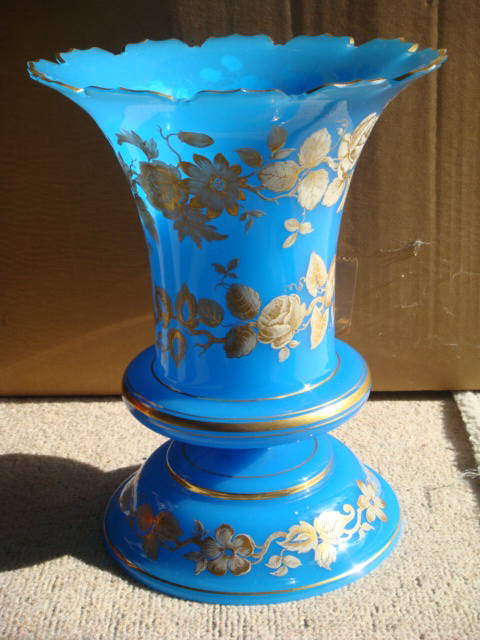 signed on the base and with raised moulded mark, 5in high approx. 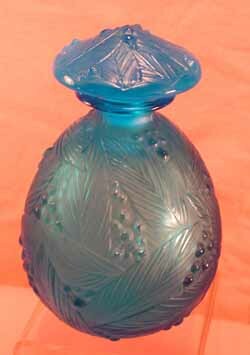 Paris, circa 1929.
double cased in blue and orange cut to clear, on a clear foot, Belgian, Early 20th Century. 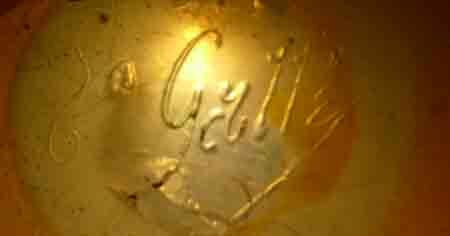 A smaller Val st Lambert tazza - cutting detail. 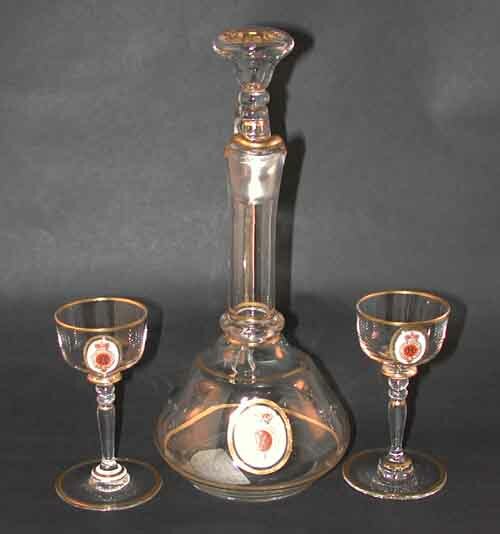 six glasses and a decanter and stopper, decanter 10in (25cm) high approx. 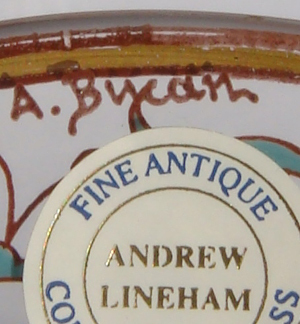 marked with 'Decorchement' within a horseshoe and B819 to base, c.1929, 5 1/2in (4cm) diam. 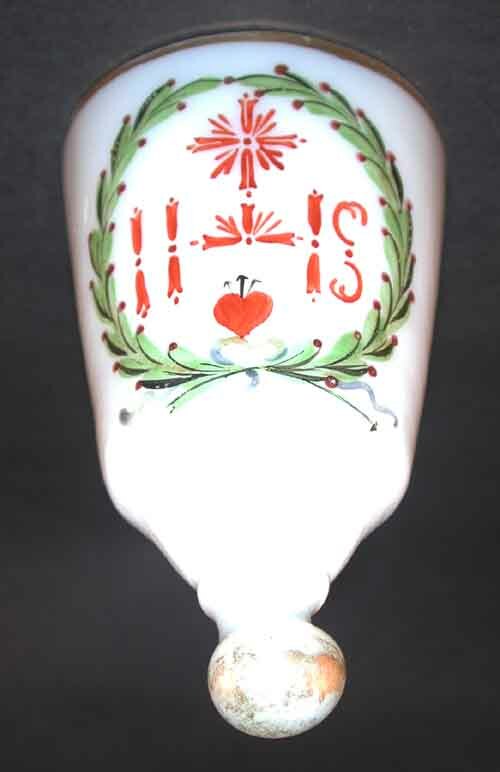 enamelled with IHS, cross and heart, Bohemian, late 18th Century, 3 1/2in Approx. 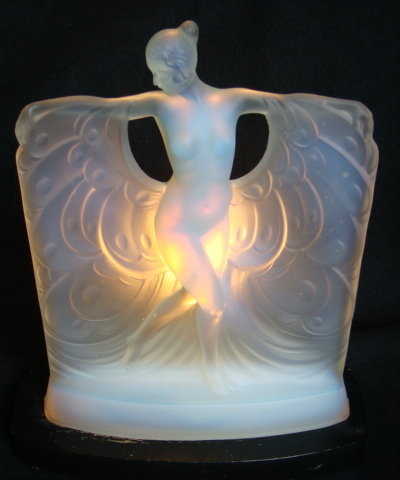 typically applied with four medallions, signed H. Navarre, c.1930, 17cm high. 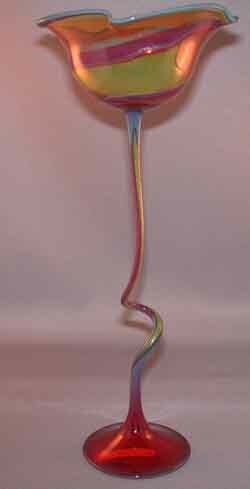 of tulip form on twisted stem, marked FX to base, 2nd half of the 20th Century. 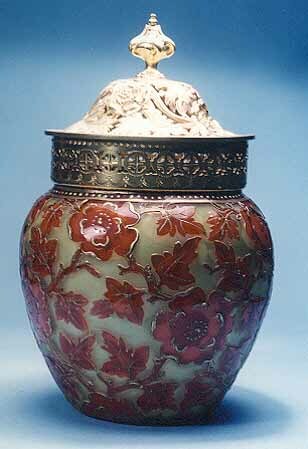 of tulip form with applied leaf, marked FX to base, 2nd half of the 20th Century. 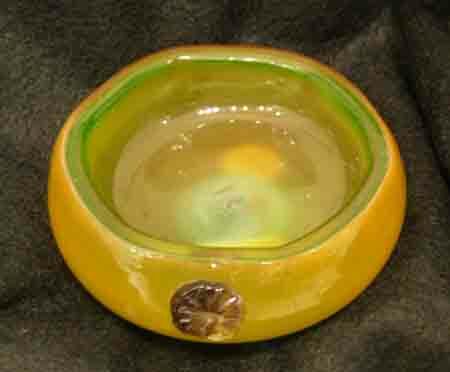 moulded with leaves and berries, c.1930, 5in (12.5cm). 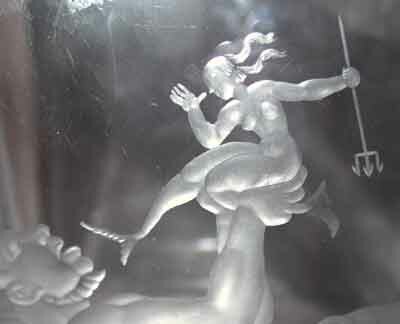 engraved with Neptune holding a mermaid aloft, orrefors mark to mase, G 1296.K034, 8in high (20cm). 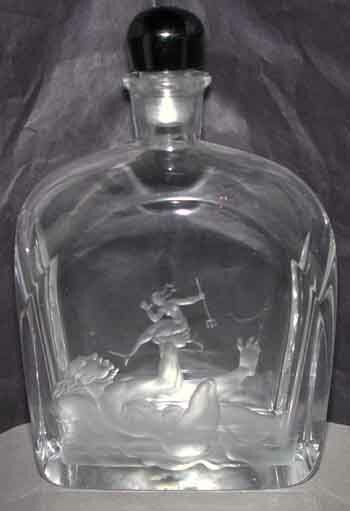 Detail from the Orrefors Decanter. 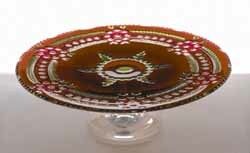 made for the Islamic market, Lobmeyr mark to base, c1890, 9 1/2in (24cm). 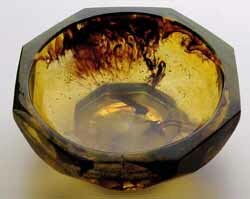 of baluster form amber cut to clear, c.1920, 25cm approx. 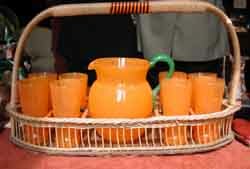 six beakers, serving jug with green glass handle and carrying basket, marked FRANCE, circa 1930, jug 10in (25cm) approx. 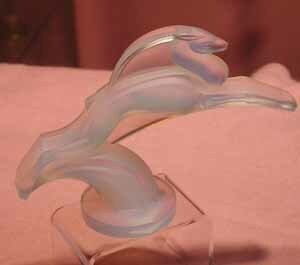 this rare piece a tour de force of the glass makers art illustrating the alabaster like quality of the paste and the intricate forms which were modelled using the technique, signed, c. 1900, 6in (15.5cm) approx. 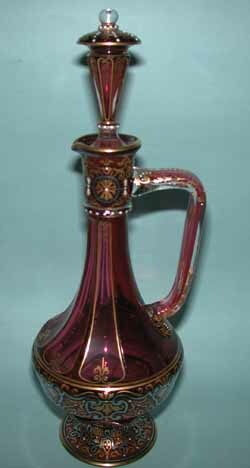 made for the Islamic Market, Petersdorf, c.1880, 9in (23cm) approx. 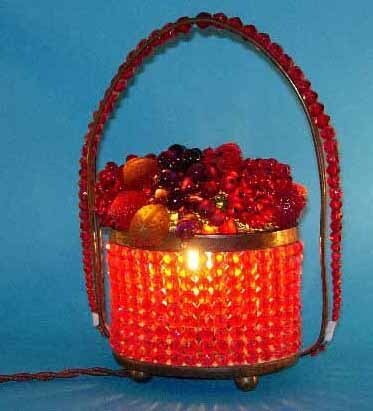 the individual glass fruit lit from below, circa 1930, 27cm high approx. 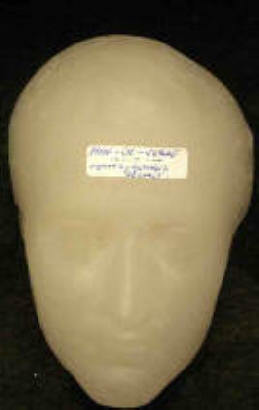 with an applied prunt to the side, 4 1/4in wide (10cm) approx (fire polishing/manufacturing flaw to interior). in champleve mount, the metal probably Barbediene, circa 1890, 8in (20cm) approx. 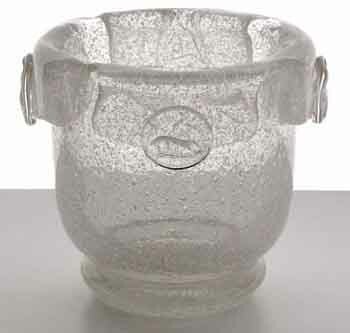 Other beakers are in Bohemian Glass Section within 'Continental Glass'. 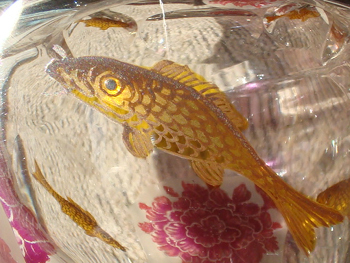 Detail of the decoration on the Egermann fish beaker. comprising decanter, stopper and six glasses, in ruby overlay glass, Arnsdorf, Haida, c.1915 9in (23cm). Probably not by Thomas Webb.